The Imrie AT300 is the first of a completely new line of products from Imrie. The Imrie AT300 is an easy-to-use appliance for testing Single or Three-Phase Alternators. The Imrie AT300 tests these alternators under load and gives you a visual representation of the alternator's output in watts, while at the same continuously checking for shorts to earth. 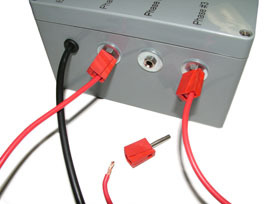 The Imrie AT300 incorporates quick connect type banana plugs, which allow for quick and easy connections and mean that any compatible looms can be used with this device. Connect the 'Engine Earth' lead from the AT300 to a good engine earth. Turn on the Imrie AT300, note the indicator LEDs will flash. After a couple of seconds only the blue LEDs will flash, this indicates the Imrie AT300 is started up and ready. Start the engine and take note of the various LEDs on the Imrie AT300. If at any RPM the 'Test Failure' LED illuminates, this indicates the alternator is faulty and has an internal short to earth, no further testing is required. Increase and Decrease the RPM of the engine, and ensure the wattage LEDs on the AT300 light sequentially. If any of these LEDs fail to light or are delayed this indicates that the output is uneven. This generally means a burnt-out phase winding. However some models have ignition exciter coils which can also cause the LEDs to light in a delayed manner. (e.g. YFM250, 350, 400, CB250, LTFs etc.) Also it is important to note that some smaller alternators may not light all the LED rows. 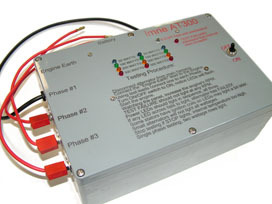 The Imrie AT300 dissipates a large amount of power across the internal resistors. As a result the tester has the capability of getting extremely hot. If the Imrie AT300 detects that it is too hot an LED will illuminate. Stop using the tester immediately if this occurs, and allow it to cool. Small Coil Rewinds Pty. Ltd. The Imrie AT300 is available for direct manufacturer purchase through Small Coil Rewinds in North Geelong, Victoria. Australia. RRP is incl. of GST. Copyright (C) 2019 Small Coil Rewinds Pty. Ltd.
"Imrie" is a registered trademark of Small Coil Rewinds Pty. Ltd.